No matter how it's prepared—in a Chocolate Lava Cake or a bite-sized Orange Liqueur Praline —nothing says decadence like chocolate. For anyone who can't get enough of this most delicious of all ingredients—and that's EVERYONE, of course—this cookbook is absolute heaven! 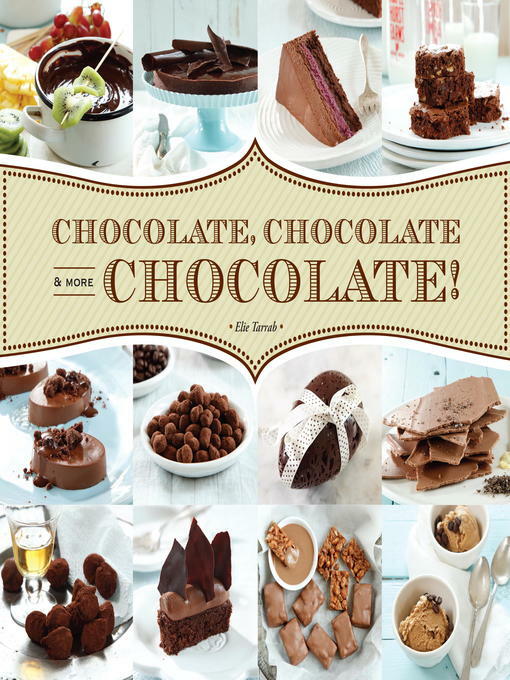 With more than eighty recipes for chocolate truffles and ganache, candies and cookies, sheets and other treats, you can open up a whole new world of deliciousness. Create chocolate bars with mint, nougat, caramel, or rum raisin and hazelnut. Put a chocolate pencil inside a kid's lunch bag as a surprise. Celebrate with a Champagne or Dark Rum Truffle; it's the perfect sweet for any special occasion. Make the holidays merry and bright with a Christmas log. Delight guests with something unusual and awe-inspiring like a Palet d'or, a creamy disc covered in shiny gold leaf. To round out the dessert menu, there are also ice creams and popsicles, éclairs, soufflés, tarts, brownies, biscuits, macaroon hearts (for Valentine's Day), and much more. And to help anyone, even beginners, handle all the necessary techniques, master baker Elie Tarrab gives easy-to-follow instructions on melting and tempering, crystallization, dipping and enrobing, molding, and creating a hollow figurine. With stunning pictures to teach and tempt you, you'll soon be in chocolate ecstasy!